What would be a feeling to recall the momentous event in our life that had transpired 46 years ago when my high school sweetheart and I were together along the seawall. I remember 46 years ago today that it was almost twilight and I noticed that sun was about to set. 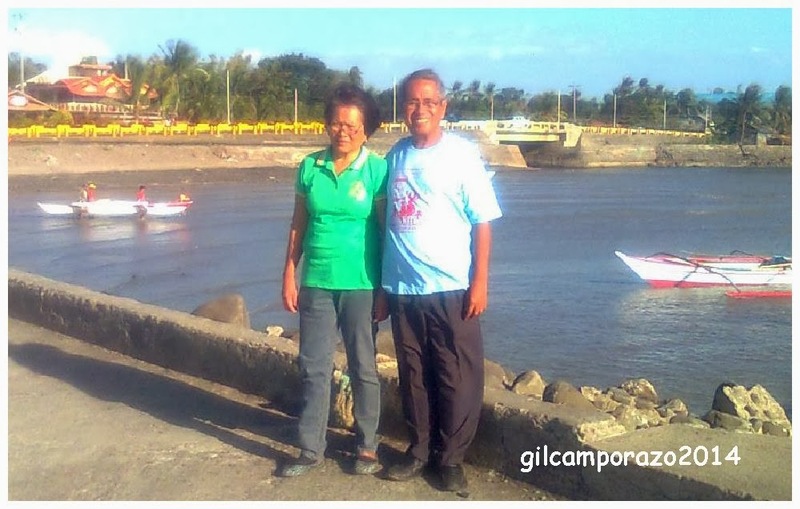 The horizon was crimson red and the seawall where we stood was freely splashed by a rushing sea water from the peaceful municipality of Valladolid, 31 kilometers (19 mi) south of Bacolod City, the capital city of Negros Occidental! We were seventeen years old then and we were third year high school. I was a pioneer student of La Carlota City High School and my sweetheart was a junior high transferee student from Saint Vincent Ferrer High School in La Castellana, Negros Occidental. The first time I met her she was too mysterious. For that mystique attitude she manifested, my curiosity was tapped and I wanted to discover her unique personality. And the rest was one of its kind love story ever happened to us and why and why we were meant for each other. Late this afternoon, my wife, Rebing and I went to Valladolid, one of the towns in Negros Occidental to witness their revelries as it celebrated her annual fiesta in honor of their patron Saint, Our Lady of Guadalupe. Our son-in-law, Almon Tolones was our driver. We used his motorized tricycle as our service vehicle. Before we proceeded to the town's public plaza, we paid a visit to his auntie's house and took our afternoon snack of fried chicken, fruit salad, a coke solo for drink. Excited as we were, we got on the tryke and went directly to overcrowded plaza. We overheard blow-by-blow account of a native dancers showing off their primitive dancing feats as they portrayed their ancient culture, source of livelihood, and traditional way of life through a rehearsed choreograph. We went through the crowd until we had a clear view of the demonstrators at the center of the plaza. 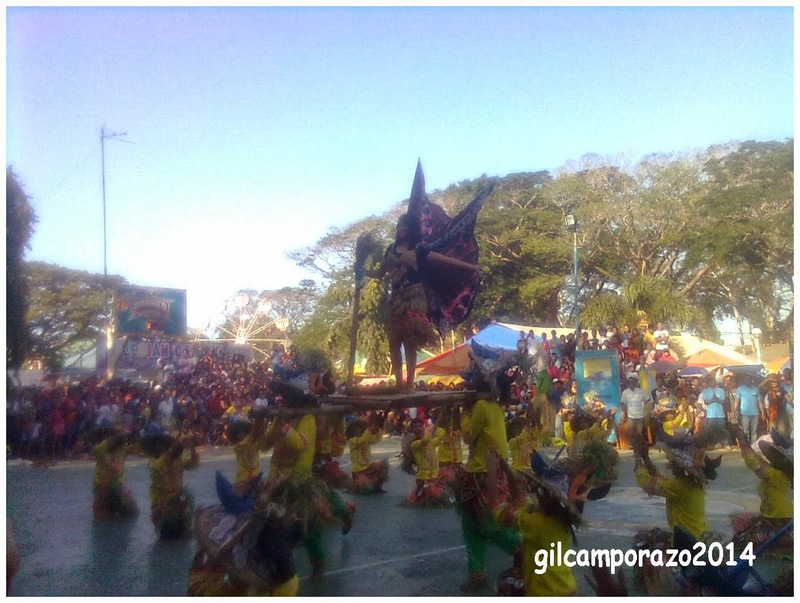 "Pasundayag" (cultural presentation) was presented by every group of district within the small town of Dolid (short for Valladolid), inspired by its battlecry, "Ugyon Dolidnon" (Let's unit people of Dolid). We watched the entertaining show of "Sagua Banwa", "Alidobay" (Alijis, Doldol, and Bayabas) for almost an hour. Each depicted their respective way of life and means of living like fishing, farming, among others. We noticed that it was getting late in the afternoon. 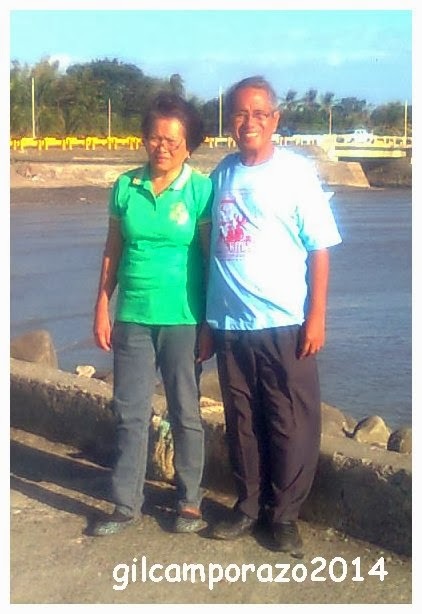 We took time out visiting the old seawall which was our tryst 46 years ago when we were yet in our junior high school. We skipped our afternoon classes just to spend time and enjoy the Dolid fiesta, visiting some friends and classmates. And it was then and there at the seawall that I stole a first kiss from my high school sweetheart, now my wife. Almon was our official photographer. He took our picture standing and the seawall and a clean seawater at the background. I sensed from my wife how happy she was as evidenced by her sweet smile. I was also overjoyed. I thought for myself that love stays as fresh as it is when it is being nurtured, cared and remembered even how long, how old it was. Going back to where we spent our momentous time and loving memories 46 years ago to Dolid seawall which is unforgettable meeting place is beyond compare. It is indescribable. This is one of the reasons when our married life is worth living, worth staying together, not only for time, but even for eternity. Yours is an inspiring love story. One friend of mine keeps on telling me that long years of relationships usually don't work out in the end because you get tired of being with the same person through time. But it's really depending on the person, and with your story, true love exists! :D Happy anniversary for the both of you. Those were the days when life's still young and more memories were recorded in the event inside your heart. So, beautiful to cherished with some friends and family too. That place has a lot of memories for you and 46 years and you can still vividly recount the details is impressive. Somehow, good memories just feels like yesterday. This i soooooo sweet. I can't wait for this to happen to me too. My husband and I had a meeting place too when were still young pals. Can't wait to go back and see the spot when we're older. It's really nice to travel down memory lane with your greatest love. Congratulations for making this last. I am happy to see you two lasts this long.. and praying that you stay together forever! Nakakatuwa talagang isipin mga bagay na ganto.. bibihira na kasi talaga..
that's how much your in-love with your wife... you recall every single moments together. 46 is tough to beat already, more to come, sir. Yahweh bless.